In addition to fireworks, the stunning new nighttime extravaganza features more lasers, lights, and projections than any show at Magic Kingdom Park before it. “Happily Ever After” is also an entirely new kind of Disney storytelling, one that takes guests on an inspiring journey filled with heart, humor, and emotion. Guests become part of the journey themselves as they follow favorite Disney characters on an adventure to seek out their destiny, face adversity and ultimately fulfill their dreams on the road to their happily ever after. The 18-minute spectacle features moments from classic Disney films such as “The Little Mermaid” and “Aladdin” to modern blockbusters “Moana” and “Zootopia.” Cinderella Castle becomes part of the story itself, with dazzling projections bringing heartfelt Disney stories to life on and around the iconic 18-story-tall castle. Quasimodo from “Hunchback of Notre Dame” swings from the turrets. Woody and his pals from Disney•Pixar’s “Toy Story” recreate the castle entirely out of toys. And Maleficent from “Sleeping Beauty” envelops the castle in her signature green flames. Because no Magic Kingdom Park fireworks display is complete without this little bit of magic, Tinker Bell flies across the night sky, reminding guests that with a little faith, trust and pixie dust, everyone can find their own happily ever after. Characters and scenes from more than 25 Disney films are featured through state-of-the-art projections, enhanced by more than 50 choreographed spotlights, brilliant lasers and plenty of awe-inspiring fireworks. Paired with an emotional score, the new spectacular drives the message home that anyone can grab hold of their dreams and make them come true as long as they are brave enough to listen to what guides them and bold enough to pursue their destiny. 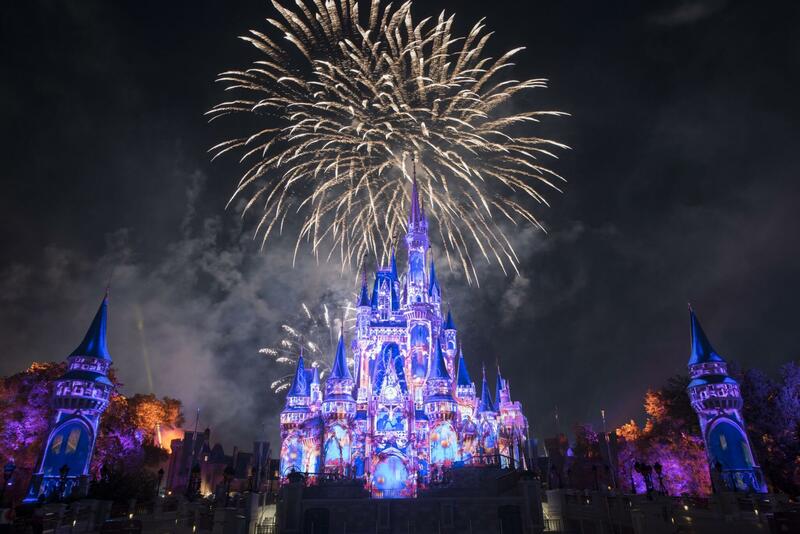 “Happily Ever After” is presented nightly. Show times vary based on park hours. Reach out and find your Happily Ever After five minutes earlier each night.